Rock Key is a Sanctuary Preservation Area (SPA) within the Key West National Wildlife Refuge, located southwest of Key West and close to Eastern Dry Rocks and Sand Key. The area is located at N 24 27.210 W 081 51.600 and provides a great opportunity for novice or advanced divers to experience coral reefs, marine life, caverns, and the site of a wreck. Since the spot is conveniently close to Eastern Dry Rocks and Sand Key, it also offers access to other diving and snorkeling opportunities. Much of Rock Key is located at a shallow to medium depth, making it ideal for novices and snorkelers. You'll find similar accessibility at Eastern Dry Rocks and Sand Key. Originally Rock Key was a shipwreck; the ship from Barcelona which sank in the 1800s is now nearly indistinguishable from its surroundings. So while you will not be able to see a well preserved ship, you may be able to find old artifacts such as brass fittings and tiles. There is another shipwreck in the area as well, though no one is sure which ship sank there. Since the area is an SPA, you may find artifacts but you may not remove anything from the area. 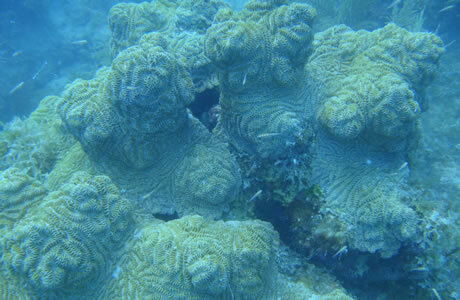 Rock Key offers many coral formations and crevices for exploration and is home to a variety of sea creatures. Some of the coral canyons are quite narrow and may only be explored by one diver at a time. There are also sandy areas which offer easy spots for beginners to get their feet wet. Rock Key and the surroundings Sanctuary Preservation Areas offer many great photographic opportunities to capture marine life memories.